The SM150 can be used with the HH150 or HH2 handheld readouts, or connected to a datalogger. 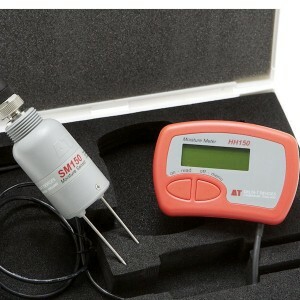 The SM150 Soil Moisture Kit is a simple, convenient, low cost option for making soil moisture measurements on the move. The kit comprises an SM150 Soil Moisture Sensor, a dedicated HH150 Moisture Meter and a handy carry case. The HH150 Meter is very easy to use, being a readout-only device (no PC connectivity). 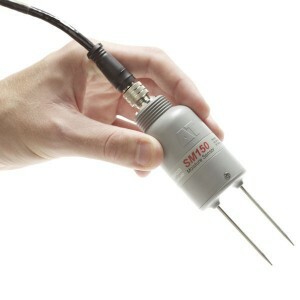 The SM150 Soil Moisture Sensor is buriable and its cylindrical shape makes it easy to install in augered holes (45mm diameter). The threaded base of the sensor can be connected to optional 50cm and 100cm extension tubes. Two sharp pins minimise soil and substrate disturbance during insertion and permit superior contact for more accurate measurements. The SM150 use the same high quality range of cables and extensions as the SM300 Sensor.